SMITH HISTORY BLOG: Was it a Riot or Just a Riotous Good Time? 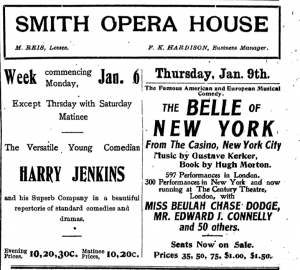 On Saturday January 11, 1902, a large group of Hobart College students were ejected from the Smith Opera House for disrupting a performance by the Harry Jenkins stock company. A protest erupted in the street outside the theatre and the student accused of starting the protest was arrested. Students then gathered outside the police department where the student was held, vehemently showing their disapproval of his arrest. The student appeared in court the following Monday and was fined for disorderly conduct. At first glance, this may seem rather cut and dry: large groups of college students behaving badly and facing public condemnation. But a deeper examination of this series of events reveals that the students may not have been as culpable as they seemed. 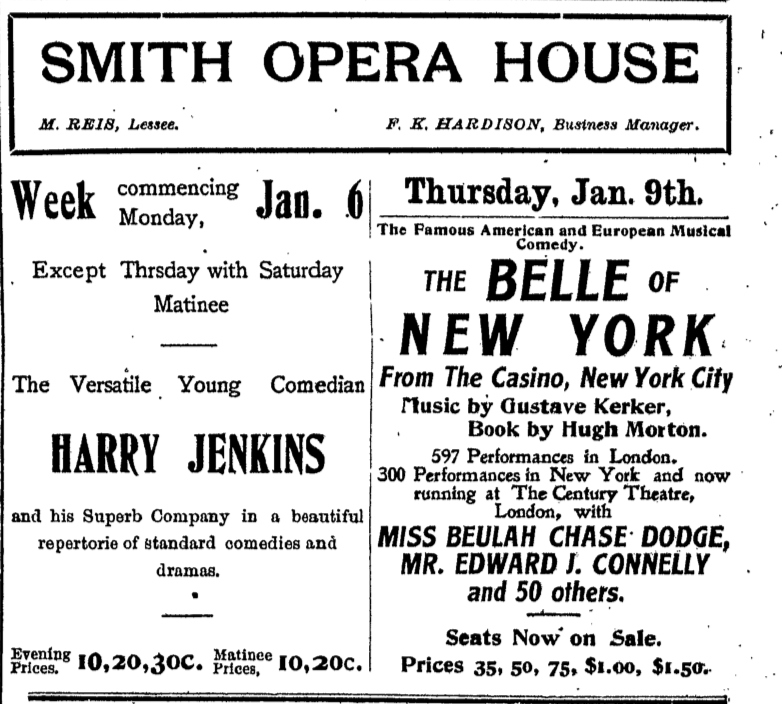 As with many traveling theatre companies, the Harry Jenkins company was in Geneva for several days, performing a number of productions from their repertoire. According to an article published in the Democrat and Chronicle, at a matinee performance on Saturday afternoon, students had “applauded without cause, and made alleged insulting remarks” (“Riot Begun” 1). The Geneva Daily Times claimed that during the afternoon performance of a piece called ‘Way Back in ’61’ that one student threw a “huge bouquet” onto the stage and that “attached to it was a huge placard, bearing an inscription not made public” (“Small Riot” 1). The Geneva Daily Times contended that the students’ unruly behavior had begun a few days earlier, during a performance of Dion Boucicault’s (racist and problematic) play ‘The Octoroon.’ A member of the company told the paper that several students had “passed remarks unfit to appear in print” and “as a result of them two of the actresses wept when they came off and declined to go on again” (“Small Riot” 1). So when the Saturday evening performance began and students once again began to make noise, Harry Jenkins himself stopped the performance and began to lecture the students on their behavior. Simultaneously, other members of the audience began to yell out from further back in the house, encouraging the opera house management to “put them out” (“Riot Begun” 1) and “give it to the Hobart slobs” (“Small Riot” 1). Several of the students were forcibly removed from their seats while the rest were instructed to either watch the performance quietly or to leave of their own volition. Approximately 40 students were removed or exited on their own. From there, the students gathered on Seneca St. to protest their removal from the opera house. Hobart student E.J. Kibbe allegedly began the protest in the street and he was subsequently jailed. 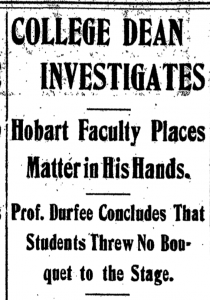 An editorial was printed the following day in the Democrat and Chronicle, criticizing Hobart College for its “hoodlumism” and cautioning that “Geneva isn’t a very big city, but it is too big to be run by a pack of noisy schoolboys” (“Instruction Needed” 6). Kibbe appeared in Ontario County Court, plead guilty, and paid a fine of $10 for disturbing the peace (“Kibbe Pleads Guilty” 4). Article from Democrat and Chronicle , 12 January 1902. But the story of the unruly college students took a surprising turn when a student wrote a rebuttal to the editorial in the Democrat and Chronicle and the faculty of Hobart College undertook their own investigation of the matter. A few days after Kibbe appeared in court, an anonymous student wrote a letter to editor of the D&C. In it, he argued that it had long been the custom for Hobart students to purchase blocks of seats to the “numerous second rate repertoire companies that grace our public stages.” He goes on to assert that the students often “go in for a little fun, which in times past has been taken as meant and resulted in good feeling all around.” He also claimed that not only were students often encouraged to join in on the singing of some numbers but that upon exiting after performances, he had heard other audience members claim that while the performances by the touring companies were mediocre, that they “enjoyed the singing and cheers of the college men immensely” (“Hobart Students’ Side” 7). According to the letter writer, the actors in the company later admitted that the cat calls and jeers came from the gallery and not from the area where the students were seated. The Hobart faculty called for their own investigation into the events so Dean William P. Durfee interviewed the management of the opera house as well as members of the orchestra. According to these interviews, the bouquet in question was not thrown by the college students. Instead, “he learned that it came from one of the stage hands and that it was thrown on the stage by a member of the orchestra.” In addition, there was no card attached to the bouquet, as Jenkins had claimed (“College Dean” 1). Evidently Geneva was the first time the Harry Jenkins company had performed in a college town. Regardless of what the anonymous student might have argued in terms of the traditions of college audiences, the oddly timed applause, cheers, and commentary were clearly disruptions to the performers on the stage. Turn-of-the-century theatre was rarely a quiet and sedate affair. Audiences at the theatre ate, drank, spoke, yelled, stomped, and regularly threw things as a means of expressing both pleasure and displeasure. Which side of the footlights you were on might determine whether you found such behavior to be a riot or merely a riotous good time. Article from Geneva Daily Times , 14 January 1902. 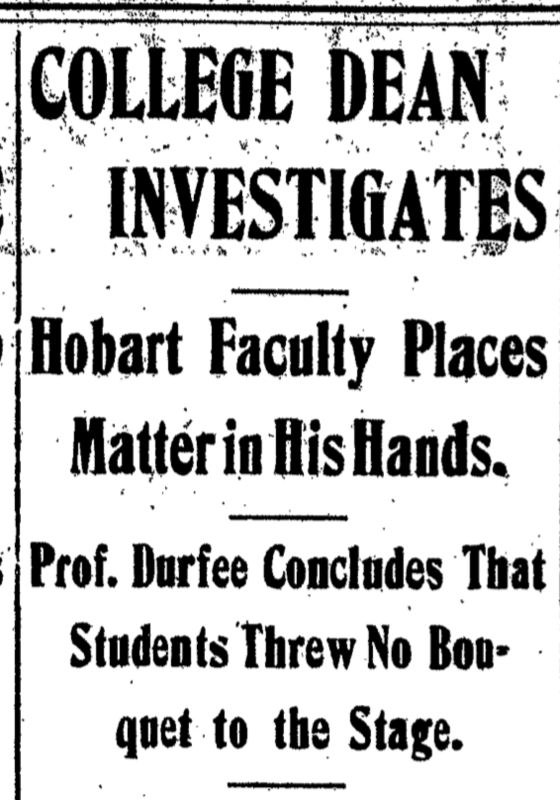 “College Dean Investigates.” Geneva Daily Times, 14 January 1902, p. 1. 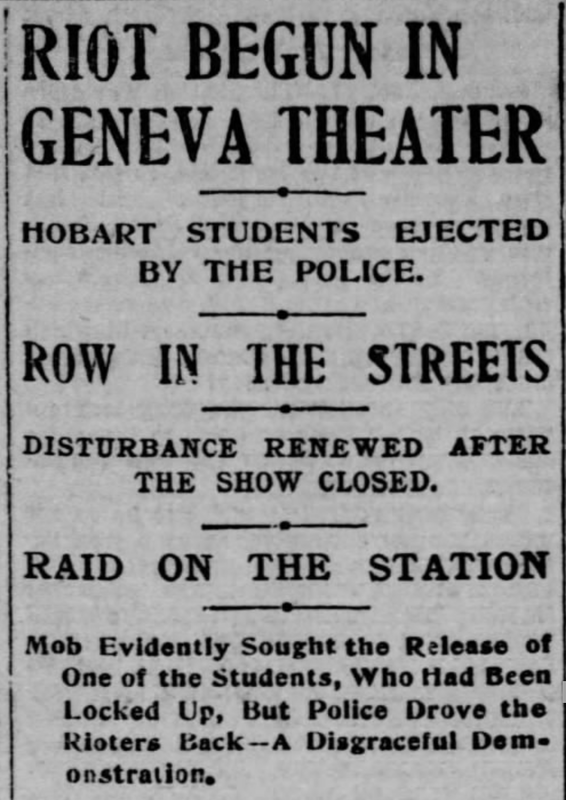 “Hobart Students’ Side of the Saturday Riot.” Democrat and Chronicle, 16 January 1902, p. 7. “Instruction Needed at Hobart.” Democrat and Chronicle, 13 January 1902, p. 6. “Kibbe Pleads Guilty and Pays His Fine.” Democrat and Chronicle, 14 January 1902, p. 4. 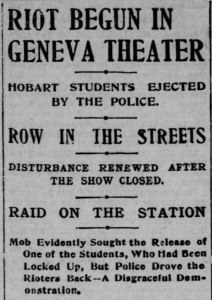 “Riot Begun in Geneva Theater.” Democrat and Chronicle , 12 January 1902, p. 1. “Small Riot at the Smith.” Geneva Daily Times , 13 January 1902, p. 1.